This is the best example of one of these seldom seen specimens we’ve produced yet! Somewhere in SW Wyoming there is a long desolate canyon called 18 Mile Canyon. An old rockhound exploring the area stumbled on this short petrified log several decades ago and it is only recently that it was cut to reveal the mystery hidden inside. The log is preserved in a very high contrast black agate that shows the growth structure clearly to the naked eye. The species is not quite like anything in my reference books and certainly not like other logs I’ve seen from this part of the state. It’s a larger diameter round that took a nice polish to really bring both the dark agate and the beautiful growth structure to life. A wonderful specimen prepared right and ready to fascinate! This is one of only a small handful of slabs that this amazing log produced. The gentleman that found it came across it decades ago and has had it sitting in his flower bed all these years since. I knew it would be special when it was cut, but had no idea it would be this dramatic! This is a center cut from a short log that has a really appealing, antiquated shape and absolutely gorgeous high contrast color patterns. The stone really is much better than the photo can convey in this case – The black agate is deep and lustrous and polished to a beautiful finish. I’ve seen some interesting species of fossil wood in the various SW Wyoming deposits of petrified wood, but I have never seen anything under the microscope that looked quite like this! I’ve provided a microphoto so you can have some fun with it too. I don’t know how much of what I’m seeing might be devitrification vs. Big resin canals, but the stacked pores of what look like a conifer make me think of things like tamarack and doug fir, particularly with those wide rays. But then those species don’t tend to have squiggly rays like this – so is that actually a hardwood of some kind? This section of the log was found next to a section where the structure was slightly clearer, but there is always the chance that they are not from the same trunk or same species. It’s a real mystery that I haven’t unravelled but you might enjoy puzzling over as well! The picture doesn’t come close to doing it justice, I promise! I guarantee the owner of this exceptional specimen will be equally amazed and mystified! 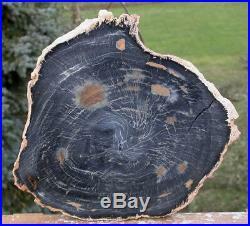 This complete round cross section specimen is a wonderful example of the flowing wood grain visible in this species. It’s been cut with a diamond saw and flat lapped to produce a mirror perfect polish. The detail and color captured and revealed through the highly polished surface are just immaculate. It’s easily some of the best fossil wood to be found anywhere! The rays are gorgeous, the agate is highly polished and the detail is easier to see in person than the photo suggests. It’s a truly special find and we won’t likely have a lot more so get a piece for your collection while it’s available! This is a slab from the center of the log and measures about 10 1/2″ x 9 3/4″ across the polished face and is cut approx 0.73 thick. Weight is 4.12 lbs. A nice, unique natural wonder collectible exclusively from Sticks-in-Stones Lapidary! The item “SiS TRULY UNIQUE Petrified Wood Round Odd Species 18 Mile Canyon, Wyoming” is in sale since Monday, February 4, 2019. This item is in the category “Collectibles\Rocks, Fossils & Minerals\Fossils\Vegetation\Petrified Wood”. The seller is “rockshop” and is located in Beaverton, Oregon. This item can be shipped worldwide.